CIVIL DISCOURSE: Conservatives and liberals sat down together in Burlington last week for a political discussion on guns. Things were civil despite the hot topic. BURLINGTON — Conservatives and liberals came together last Thursday evening at the Study Hall in Burlington for a “thought exchange” experiment in civil conversation. The event, sponsored by True North Reports, consisted of folks with opposing views pairing off and chatting for seven minutes before switching up and then doing it again. 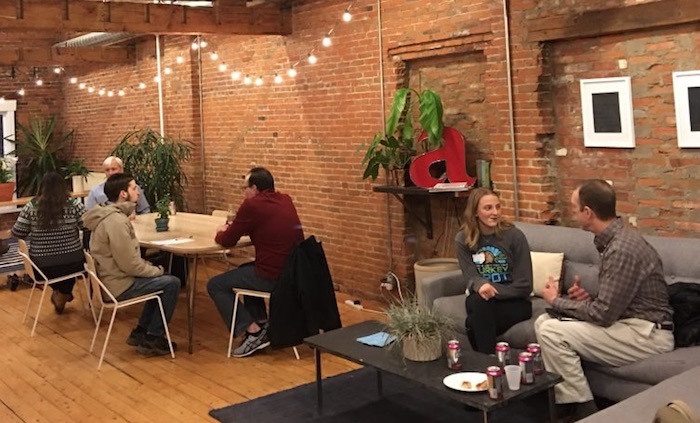 Participants did five sessions in an hour, and each person graded his or her dialogue partners on how well they listened and contributed to understanding their viewpoints, even though they may have disagreed. The topic of the evening was guns, a highly divisive issue since Gov. Phil Scott signed S.55 and other gun measures pertaining to universal background checks, magazine ammo capacity limits, and more. Asher Crispe, executive director of Vermont Future Now and moderator for the night, said he noticed various communication patterns that emerged throughout the session. Part of the group dynamic involved bringing together people of different ages, genders and life experiences. Generally, however, pro-Second Amendment participants were older males, while gun regulation supporters were college-age women. Megan Oates, a UVM student, said the experiment was positive. “I think it was interesting to talk to people with different points of view and at different stages of life,” she said. “A lot of times when you are a student and when you are in school, you kind of get caught up in the points of view of the people who are around you and the people who are sharing the same experiences with you at the same time. Dan Feliciano, of Essex, received the highest average score among all the participants. He told True North his approach to each conversation was to focus on understanding. UVM student Holly Coughland said face-to-face communication improved the interactions overall. “It’s very easy to get trapped in a regurgitation of your own views through [social media] like Facebook and through living in proximity to other students,” she said. “[With] Face to face in an argument, there’s no computer screen to hide behind, [and] there’s no time in a normal conversation to go through your thoughts and organize them and structure them in a sentence. “It’s a very raw and natural way of learning about other people’s opinions, and I felt like I learned a lot,” she said. Another UVM student, Jack Cahalane, said most political discussions are taking place “through impersonal media,” and that the medium “changes how people say things” relative to how they might communicate in person. UVM student Olivia Datre said the forum was constructive for learning new things. After the event, Crispe said he plans to edit the film footage shot at the event and publish it on social media to attract participants for future discussions of controversial topics. Talking about guns is a cop-out. Bring up gay “marriage” or abortion and the conservatives wouldn’t get out of there alive. Where did they ever find a conservative in Burlington? So there still might be some common sense still around in the Hollowed Halls of UVM. I think there should be a lot more of these discussions. Especially with all school students, be it high school or college or both. I believe that 90% of students are being taught mainly liberal and socialist views. They are surrounded by this daily and they get brainwashed in their thinking. It would be good to listen to both sides in a healthy discussion.